The spiral galaxy in the picture identified as NGC 2841 is located in the constellation Ursa Major. In opposition to grand design spiral galaxies it does not have well defined and evolved spiral arms, but many small and fragmented ones. Galaxies with these properties are called flocculent spiral galaxies. In case of NGC 2841 the number of small arms and the degree of their fragmentation makes the galaxy the specimen of its kind. NGC 2841 is a spiral galaxy located in the constellation Ursa Major, its de Vaucouleurs classification is SA(r)b. The galaxy resembling Messier 63 was discovered in the late 18th century, in 1788 by William Herschel. 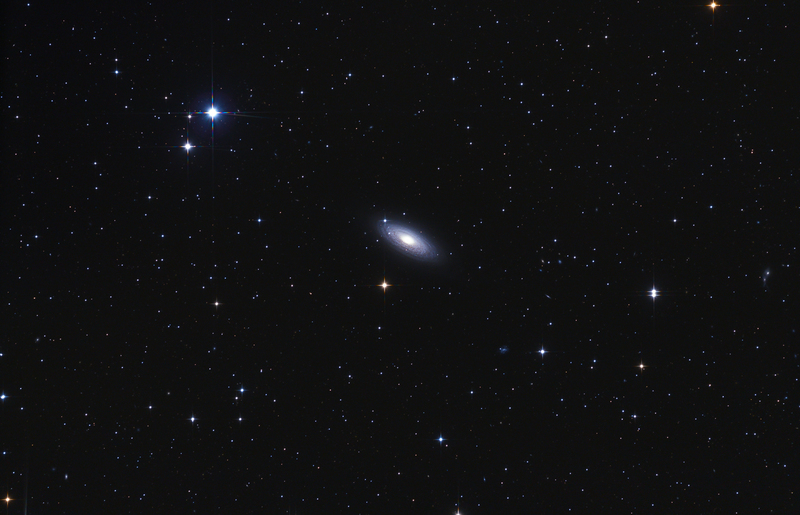 NGC 2841 used to be called the prototype of flocculent spiral galaxies. Unlike grand design spiral galaxies, flocculent spiral galaxies have many small, fragmented, patchy arms. A more common member of the class of flocculent galaxies is Messier 63, the Sunflower galaxy. The name refers to the similarity between the appearance of the arms of the galaxy and the way seeds are located in a sunflower. Almost one third of spiral galaxies are flocculent, while the occurrence of grand design galaxies are only 10%. In astronomy there are several methods used to determine the distance of galaxies, depending on the observational possibilities of a given galaxy. One of the simplest methods is based on the redshift of light coming from galaxies. Even in case of dim galaxies it is easy to measure how much its light is shifted towards red (or blue). The shift is caused by the Doppler effect, the higher the speed the galaxy is moving away from (or towards) us, the more its light is shifted towards red (or blue). Based on the measured redshift, the speed of the galaxy can be calculated. In 1929 Edwin P. Hubble discovered that relative speed of galaxies are proportional to their distance, thus the distance of a galaxy can be calculated by knowing its relative speed. The coefficient of proportion between distance and speed was named as the Hubble constant by the thankful successors, the relation itself is named as Hubble's law. Another distance-measurement method is utilising the fact that a brightness of an object is inversely proportional to the square of its distance, thus if there are two objects having the same absolute brightness, but one of them is 10 times farther than the other, its apparent brightness is 100 times lower. This phenomenon can be used to determine the distance of galaxies if objects with known absolute brightness can be identified in the galaxy, and the apparent brightness of them can be measured. In 1912 Henrietta Swan Leavitt realised that the period of δ Cephei type variable stars (so called cepheids) depends on their absolute brightness. The absolute brightness of such stars can be calculated from their period. Similar relation was discovered between the shape of Ia type supernovae and the shape of their light-curve. Objects with known or determinable absolute brightness are also referred as standard candles in astronomy. If standard candles are identified in a galaxy then their measured apparent brightness and calculated absolute brightness can be used to determine the distance of the candles and the galaxy containing them. In case of NGC 2841 its redshift has been known for long time, and its distance was determined to be 31 million light years using Hubble's low. Then in 2001 during the cepheid survey of NGC 2841 identified 18 high quality cepheids in the galaxy using the Hubble Space Telescope (which is also named after Edwin P. Hubble). Based on these 18 cepheids the distance was calculated more precisely, the result is 46 million light years. In the majority of spiral galaxies intensive star formation can be observed, not like in NGC 2841, in which the star formation rate is low. Although there are many young stars in the galaxy only a few patch of star formation was identified in it. The decreased rate of star formation is probably caused by the strong stellar winds of the young stars, by destroying the remains of the gas cloud they were formed of.